The student protests at the University of Missouri and resignation of former President Timothy Wolfe on Nov. 9 have sparked similar protests at college campuses around the country. Many students say the Black Lives Matter movement, which grew nationally following the protests of the fatal shooting of Michael Brown in Ferguson, Mo., in 2014, has inspired them. On Thursday night, student protesters at Dartmouth College vocalized their support of the movement. Activists began to chant “Black Lives Matter” in the school library, shown on cell phone video. 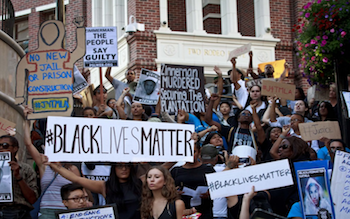 The geography department and African and African-American studies program at Dartmouth added a spring-term course “10 Weeks, 10 Professors: #BlackLivesMatter,” dedicated to considering race, structural inequality and violence in both a historical and modern context. At Dartmouth, an Ivy League university in Hanover, N.H., race-related tension has existed on campus for quite some time.Thestudent body is 47 percent white, 14 percent Asian, 8 percent Latino, 7 percent Black and 2 percent Native American. Last year, in pursuit of a Freedom Budget, students held an overnight sit-in in the office of the president. The budget addressed concerns over diversity, including among faculty; perceived sexism; and the atmosphere for underrepresented people, including the LGBT community. Their grievance, in short, is that they don’t feel like Dartmouth is fostering a welcoming environment. I met with these students yesterday and again today, and I deeply empathize with them. I made it clear, however, that meaningful change is hard work. Progress cannot be achieved through threats and demands. Disrupting the work of others is counter-productive. Academic communities rest on a foundation of collaboration and open dialogue informed by respectful debate among multiple voices. At Brown University last week, students joined their peers at other colleges in protesting racial discrimination on their campuses. Students shared personal statements and experiences followed by a walkout and teach in from Africana graduate students. Brown is located in Providence, R.I. The student body is 43 percent white, 12 percent Asian, 11 percent Latino, 6 percent Black and less than 1 percent Native American. Currently, the university is facing racial bias allegations from a Dartmouth student. Brown University President Christina Paxson has called for a full investigation and regular meetings on racial issues after a campus police officer handcuffed a Dartmouth student during an encounter that officials called “heated and physical,”according to the Providence Journal. Geovanni Cuevas, 23, a senior Dartmouth delegate attending the annual Latinx Ivy League Conference, said a public safety officer slammed him against a wall, threw him to the ground and handcuffed him early Saturday morning. Hewas waiting in line outside a party at the Machado House on Prospect Street when he told the officers they were acting inappropriately toward a drunk Brown student. At the conference, Latino students from Ivy League schools gather to discuss race, gender and socio-economic issues. Paxson apologized in an email Saturday to the campus community. Students at Georgetown University in Washington, D.C., participated in a sit-demonstration on Friday at the office of President John J. DeGioia to ask for the name of Mulledy Hall, which is currently under renovation, to be changed. According to The Georgetown Voice, the student-run publication, the residence hall is named after the school’s 17th president, and a slave owner, Thomas F. Mulledy. He sold 272 Black slaves owned by the Jesuits in charge of the school to pay off $47,654.54 in operations debt in 1838. The student body at Georgetown is 59 percent white, 9 percent Asian, 8 percent Latino, 6 percent Black and less than 1 percent Native American. Previously, instead of changing the name, President DeGioia established the Working Group on Slavery, Memory and Reconciliation, a 15-member advisory group comprised of three students and faculty. The group’s goal was to assist him in addressing the school’s history with slavery. In an email sent on Saturday, DeGioia said that until a permanent change is made, Mulledy Hall will be known as “Freedom Hall” and McSherry Hall will be “Remembrance Hall.”McSherry Hall was named after William McSherry, a Georgetown president,who advised Mulledy on selling of slaves. He sold slaves as well. Additionally, the Working Group will also have events for dialogue regarding the issue on Nov. 18 and 19 and a teach-in on Dec. 1. Also on Thursday, the same day Mizzou announced its interim president, a protest took place at Ithaca College in New York. Organized by People of Color at Ithaca College, students chanted “Tom Rochon! No confidence!” during the protest. Similar to Mizzou, students demanded Rochon’s resignation for his failure to effectively deal with a string of racist incidents on campus this semester. The organization has called for a campus-wide vote for “confidence” or “no confidence” in Rochon. Students have requested responses by Nov. 30. Yale students set off a round of protests on the school’s broader racial climate. Thousands of students participated in a “March of Resilience” on Monday against racial insensitivity. Studentsshowed their solidarity with the University of Missouri at numerous institutions, including: Howard University, Emory University, Wesleyan University, Purdue University, University of Oregon, Drake University, Harvard University, Vanderbilt University, Virginia Commonwealth University, Claremont College, Penn State, Columbia University, Rutgers University, Albany, UCLA, Stanford University and Stony Brook University.